We live in a new age of global companies, hyper-access to information, and accessibility to tools that enable us to bring any idea life. Strangely, our workplaces are lagging behind the promise of this open and collaborative world. Most organizations are rule-based, top-down, dreary environments optimized for conformity and little else. The Work Revolution creates a compelling portrait of a different kind of work. Julie Clow articulates the rules we follow today in our work force, the reasons they no longer work, and what we can do instead. The Work Revolution deconstructs the magic behind thriving, liberated organizations (such as Google) into clear principles that any individual, leader, and organization can adopt to create sustainable and engaging lives. 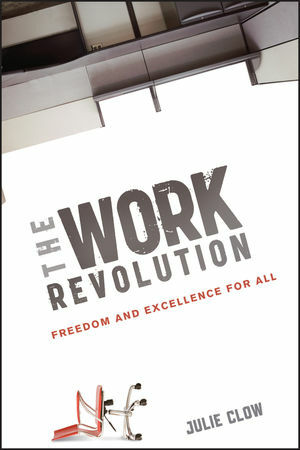 Rejecting productivity Band-Aids and quick fixes, The Work Revolution conceptualizes a completely new workplace that embraces the always-connected reality to create organizations in which high achievers can sustainably thrive. JULIE CLOW started her career at a training development company in Orlando, Florida, and quickly rose to become the Chief Learning Officer. She joined Google in 2006 and spent five years there leading team effectiveness, leadership, management, and organizational culture initiatives. She has worked on organizational improvement initiatives for a wide range of commercial, government, and even military organizations, such as the U.S. Navy and Marine Corps, Asia-Pacific Economic Cooperation, BellSouth, and SunTrust Bank. Julie also serves on the board of directors for the American Society for Training & Development (ASTD) and is a frequent speaker at industry events. She holds a PhD in behavior analysis from Auburn University. She currently resides in New York.